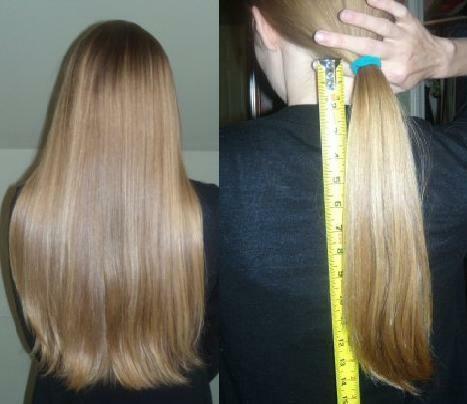 "I am cutting my hair and it is mostly 12.5-13.5 inches long, with the longest strands reaching to 15.5 inches (pictured above). I don't straighten or blow dry. Silky, smooth, and lays straight with no need for straightening. Never drink, never smoke, healthy diet. I will cut it after money is received. I receive compliments all the time on my hair. $600.00 or best offer." One of my bald friends said, "If you guys want to waste your hormones growing hair, go right ahead." This reminds me of the Scottish school custodian on the Simpsons, who, as Bart and Homer are filching the grease from the cafeteria traps, wails, “My retirement grease!"